Wahama’s Dalton Kearns (23) and Ricky Kearns (20) both take flight moments after that White Falcons captured the 2015 Class A baseball title Saturday at Appalachian Power Park in Charleston, W.Va.
Wahama shortstop Kaileb Sheets, left, applies a successful tag to Man’s Braden Grffin (3) during the fourth inning of Saturday’s Class A baseball final at Appalachian Power Park in Charleston, W.Va.
Wahama starter Mason Hicks delivers a pitch during the seventh inning of Saturday’s Class A baseball final against Man at Appalachian Power Park in Charleston, W.Va.
Wahama fans cheer as Ricky Kearns, left, swoops in with a run during the sixth inning of Saturday’s Class A baseball final against Man at Appalachian Power Park in Charleston, W.Va.
Catcher Philip Hoffman shares a laugh with third baseman Ryan Thomas (14) during the seventh inning of Saturday’s Class A baseball final against Man at Appalachian Power Park in Charleston, W.Va.
Wahama’s Jared Nutter watches a two-RBI single take flight during the sixth inning of Saturday’s Class A baseball final against Man at Appalachian Power Park in Charleston, W.Va.
An outside view of Appalachian Power Park in downtown Charleston, W.Va.
CHARLESTON, W.Va. — To be the man, they had to beat Man. After Saturday at Appalachian Power Park, Wahama is the man. 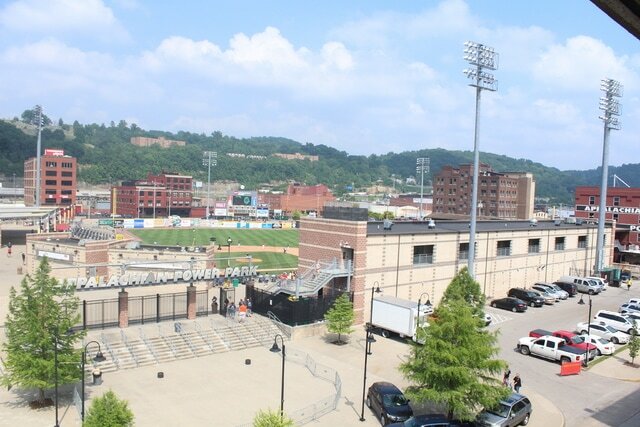 The White Falcons captured the program’s third state championship in baseball Saturday afternoon with a 7-0 victory over defending champion Man in the 2015 Class A final at Power Park in Kanawha County. Wahama outhit the Hillbillies by a 12-4 overall margin and used a six-run sixth inning to blow open a tightly-contested 1-0 contest through five innings of play. The White Falcons have now won six straight Final Four games, which includes state titles during their last two trips in 1996 and 1998. WHS also now owns an 8-3 overall record in the Class A state baseball tournament. Complete details of Saturday’s Class A championship contest will be available in the Tuesday sports editions of the Point Pleasant Register, Gallipolis Daily Tribune and The Daily Sentinel.